Set includes: 8 oz. Whoopie Cream Shea Butter for body, 2.4 oz. shea butter hand cream, 3.3 oz. body wash and 1.7 oz. travel candle. Like all FarmHouse Fresh products, all items in this gift set are Paraben- and Sulfate- Free. FarmHouse Fresh's Whoopie! Deluxe Boxed Gift Set makes the perfect gift for Valentine's Day! 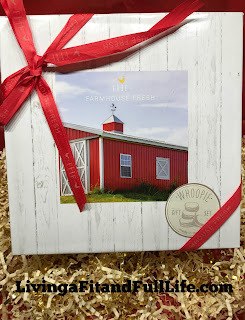 If you haven't smelled FarmHouse Fresh's Whoopie collection, you're missing out! I absolutely love how sweet and heavenly it smells and have to admit it's probably one of my all time favorite scents. Everyone that smells is asks me what smells so good and I know right away that they're asking about the FarmHouse Fresh Whoopie shea butter hand cream that I applied earlier as I keep it in my purse and use it often. It seems like everyone absolutely loves the way it smells. So much so that they even ask me where they can purchase it. When I learned FarmHouse Fresh had come out with a Whoopie! Deluxe Boxed Gift Set I was thrilled! FarmHouse Fresh's Whoopie! Deluxe Boxed Gift Set comes with a full-size body cream, hand cream, travel-size body wash and candle and is definitely going to be a hot seller! If you're looking for the perfect gift for her this Valentine's Day this would make an absolutely wonderful gift that she will surely love!